The Large Hadron Collider (LHC) is a pretty impressive piece of work, in both the sheer scale and complexity of the thing, and what it is trying to accomplish. Situated on either side of the Franco-Swiss border near Geneva, between 50 and 175 metres below the surface, it is a circular tunnel with a circumference of 27 kilometres , at a depth ranging from 50 to 175 metres underground. Just a tunnel? No. There’s all manner of machinery – 7000 tonnes of concrete, metal, glass, plastic, cables and computer chips – constituting the world’s largest and highest-energy particle accelerator. All of which can, it is hoped, reproduce the beginning of the universe, the Big Bang, firing at almost double the speed of light opposing proton beams, and seeing what happens when they collide. That, and things like investigate the validity of Grand Unification Theories, and… other physics matters. An atlas for time travel: A bird’s eye view of the construction, along with an overview of what it is trying to accomplish. A pull tab feature brings particles into collision. Entering a new dimension: Here we look at all the construction underground – a worm’s eye view if you will. Three pop-ups show you how ATLAS was built, the control centre, and the challenges of construction. Making tracks: Seven pop-ups, plus drawings, show you how the experiment works. Destination universe: A big ideas book needs a big finish, and this one finishes with the granddaddy of big, the Big Bang. Five pop-ups tell the story of the universe from its very beginnings to the present day, and posit the theories that the ATLAS experiment is investigating. The book’s authors are Emma Sanders and Anton Radevsky. Emma is the leader of the CERN Microcosm exhibition centre, while Anton is an acclaimed author of pop-up books. 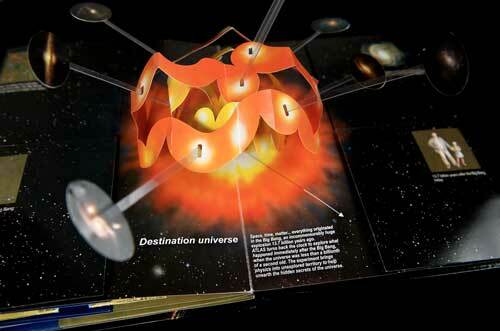 This is a small scale look at what is an enormous topic, and while it may not be the best pop-up book ever made, if it sparks imaginations to look further into this endeavour then that is a good thing indeed. CERNTV and one of the CERN physicists give us a video tour of the LHC and the Voyage to the Heart of Matter: The Atlas Experiment book. The 2nd Edition of Voyage to the Heart of Matter: The Atlas Experiment is available for pre-order now, and will go on sale in July. There are several places to order it from, including Amazon, and will retail for around US$25.